When you conclude an email, it’s helpful to include not only your name but also your title, company and contact information. 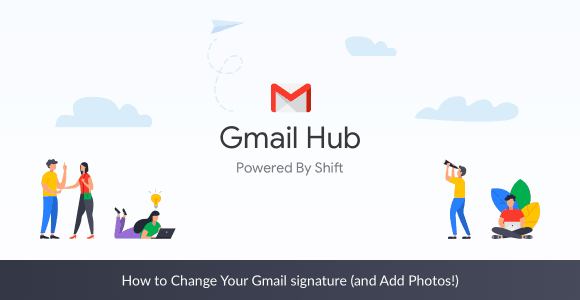 Google allows users to easily add a personal Gmail signature to be automatically added to the end of each email. Some people even add an image or a company tagline, something to add a little of your personality to an otherwise dry email. 1. Open Shift on your desktop or go to Gmail and sign in. 3. In the signature section, add your signature. Tip#1: One easy way to improve the layout of your email signature is to use a template. Our friends at HubSpot created a user-friendly email signature generator where you can even add clickable social media icons! Tip#2: You can include images! Try adding your company’s logo or your personal branding to make your email pop out. Tip#3: You can also change the font format, such as making your name appear in italics, so it looks like you “signed” your email or a Bold font to highlight any information. 1. Open Shift on your desktop and sign into Gmail. 2. Click on “settings” and access the drop down menu above the signature text box. 3. Choose the address you wish to create a signature for. 5. When composing a new email, you will be able to choose the address and email signature you wish to send the message as.